In a highly visual culture, people find that they need to use images, alongside the printed word, the proclaimed work and music, to communicate messages from the Gospel and Christian teaching. 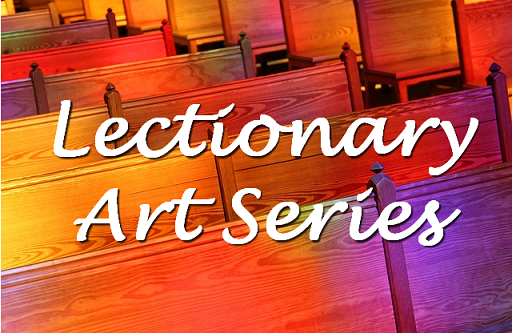 The Lectionary Art Series is a set of suggested images images chosen to represent or complement the stories or themes / messages for a particular day's of readings and Propers, or a particular liturgical season. Initially it is based on the Sundays in the Roman Catholic lectionary. All suggested pictures are free-use - meaning that they are either in the public domain because the artist died a long time ago, or that the artist / creator has said that they may be freely used. In some cases, this permission may be for a limited set of uses, eg only with a church, or only for non-commercial purposes. The classification of a picture as "free-use" is based on the most-common features of copyright laws: Because the law is different in every country, there can be cases where a work is in the public domain in some countries but not in others. So for each image the original source and copyright information are provided, so you can decide whether you can use it in your country and situation. Because they are free-use, these images can be used in any way: projected, as bulletin inserts, in worship aids, banners, etc. Line art - simpler images, usually in black-and-white or one colour and with simple lines, which reproduce well when photocopied or projected in low-contract settings. Sometimes the images presented are simply a small sample of what's available. In other weeks, though, there may be difficulty in finding suitable images - and there may even be times when no options are suggested in some categories. Other tools for finding pictures and photographs for church use are listed here. An index page for all lectionary art posts will be provided soon. In the meantime, click here to see the latest posts.